Once construction is done and the site cleanup is complete, your building is open and ready for use. With all the moving parts and installed systems, regular building maintenance is key to efficient operation. Just as important, your building may need to maintain operational parameters based on coding standards. How do you keep up with all of it? Call the Door Docs. Depending on your issue, you may need to call a carpenter, electrician, access control technician, security contractor, fire control inspector or more. Then, the finger-pointing starts, and you are stuck trying to figure out who can fix your problem. Or, you can call the Door Docs. We can handle all your issues. One trusted company means no finger-pointing, just results. 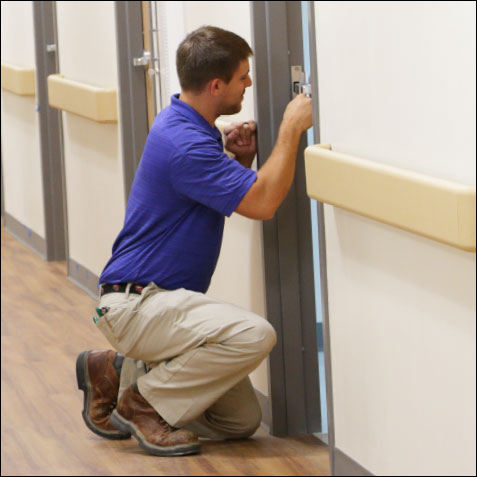 We’re the Door Docs and we keep your building healthy. on going maintenance, and we come to you. Our trained technicians provide regular maintenance and inspections to ensure everything stays in working order. If a repair is needed, we can fix it on-site or leverage the skills and equipment in our facility to solve the problem. On-site maintenance is an unavoidable reality. Why not use your trusted source that can handle all aspects, not just one specialty? Give us a call to learn how our trained technicians can not only address your immediate need, but setup a scheduled plan to keep everything in top-shape. We’re the Door Docs. Keeping you in great shape.